This week we get together to discuss Drew Goddard’s new film, “Bad Times at the El Royale. This film has a great ensemble cast, including Dakota Johnson who is having a huge year this year! 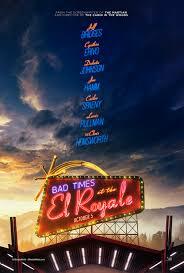 It’s 1968 and several strangers gather at the El Royale hotel in Lake Tahoe with a lot of Bad Times in its past. Let us know what you thought in the comments below!